I have never been to Mexico. Mexico was not even very high on my list of dream places to go to before I die. But that was before my visit to Taqueria Los Cunados, which opened fairly recently in the Eaux-Vives district. I must warn you that it is extremely hard to have dinner in this restaurant. You must book a table, and you must do it, days, if not weeks in advance. If you are brave enough, you can try to show up around 9pm, have a delicious cocktail at their bar and hope that a free table will miraculously be opened for you. Yes, miracles do happen, sometimes. Yes, they are victim of their success. But, do not be discouraged, I promise, it is worth every effort. I do not know where to start to describe it, as it is so good and so perfect in every aspect. First, the décor. 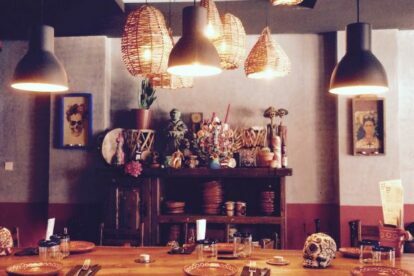 Every plate, every glass was thoughtfully picked by the owners and are handmade and handcrafted in Mexico by local artists. It is so trendy but so authentic at the same time — they’ve truly found the perfect balance. Second, the food: the plates are small and we recommend ordering 3 to 4 different things in order to be full. Nevertheless, the food is really delicious and also seems really authentic (to a non-expert). Finally, the desserts and cocktails are to die for and a must try. For a fun and exotic evening in Geneva, it is a must!